Which of these headlines is most likely to spur you to sign up for a webinar? The first focuses on the webinar. But the second one focuses on me doing things. That makes the second one more compelling. Want to watch your words get shorter, your sentences sleeker? 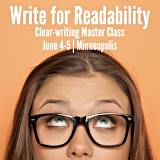 See your passive voice disappear and your readability soar? Energize your writing? Populate it with real, live humans? Focus on benefits instead of features? Use the active voice in writing. In other words, write about people doing things. In a sentence written in passive voice, the subject is acted upon by the object. Object verb subject. In a sentence written in active voice, the subject performs the action. Subject verb object. That’s important: Writing in the active voice helps people read sentences faster, understand them more easily, remember them longer and enjoy the process more. No: Medicaid eligibility is organized by category or population each of which has different rules for how much income and resources you can have. For the most part, only citizens and qualified immigrants can qualify. The largest Medicaid categories covering most eligible individuals are Children under age 19, Parents raising children under age 19, Pregnant Women, Individuals 65 and older, and Persons with Disabilities. The difference in readability between writing about Medicaid and writing about you? Sentences are 73% shorter; words, 111% shorter; and Flesch Reading Ease is up 192%. Use the simple sentence structure: Subject verb object. Think of your sentences as short stories with clearly identifiable characters acting concretely. No: Its failure could affect vehicle directional control, particularly during heavy brake application. Yes: You won’t be able to steer when you put on the brakes. Make subjects humans. Write about people doing things, not about things doing things. No: Growth occurred in Pinocchio’s nose when lies were told by him to Geppetto. Yes: Pinocchio’s nose grew longer when he lied to Geppetto. Write in verbs, not nouns. Nix nominalizations, or words that turn verbs (like explain) into nouns (like explanation). No: Our expectation was for a National Labor Relations Board (NLRB) ruling that management interference with the strike or harassment of picketing workers was not permitted. OK, that one’s been through the De-Verb-O-Rizer a few times! Look at the verbs buried in those nouns: expectation, ruling, interference, harassment. Yes: We expected the National Labor Relations Board (NLRB) to rule that management could not interfere with the strike or harass picketing workers. Wendy Jorgensen increased readability of this message by 40%, mostly by focusing on people doing things. On April 3, [Subject: plan] the Plano Tomorrow comprehensive plan was launched online in draft form. [Subject: plan] The plan will be the guiding document for future development, transportation design, City service implementation and management of City parkland. [Subject: format] The web-based, interactive format of Plano Tomorrow is an emerging concept in cities around the world and is the first to be introduced by a Texas community. [Subject: plan] Historically, Plano’s comprehensive plan has been in a printed format that could only be accessed in person or downloaded online. [Subject: it (plan)] “In essence by doing the comprehensive plan in this format, it becomes a living document that can evolve as our population changes and new trends in development arise,” said Planning Director Christina Day. [Subject: you] Explore the 15 videos outlining aspects of the plan, watch as actions in the plan progress and rank the actions that matter most to you. [Subject: plan] The plan was launched in advance of the Planning and Zoning Commission work session on Thursday, April 9 at 6 p.m. at Plano Municipal Center, 1520 K Ave. [Subject: session] The work session will focus on the draft Plano Tomorrow plan. [Subject: residents] Residents will be able to attend in person or to message questions through the City of Plano Facebook page or to post questions on Twitter with #PlanoTomorrow. [Subject: you] Check out the plan at planotomorrow.org. Note that 70% of these sentences focus on things doing things, not on people doing things. [Subject: Tom Smith] Tom Smith takes the DART Rail every day to work. [Subject: Tom Smith] To get to the station, he walks 3 miles and some days the lack of sidewalks is challenging. [Subject: Tom Smith] He hopes to change that with Plano’s comprehensive plan. [Subject: Tom Smith] He ranks sidewalks as a program he wants prioritized in the new Plano Tomorrow interactive. [Subject: you] Put your mark on the plan to shape future growth and improve traffic delays and City services and parkland use. [Subject: rankings] Rankings are weighed during the annual budget process. [Subject: you] Show us how you want your tax dollars invested at planotomorrow.org. Whittled word count by 13%. Slashed paragraph length by 68%. Reduced Flesch-Kincaid Grade Level by 38%. Increased Flesch Reading Ease by 40%. Want results like these for your own message? Use the active voice in writing. Write about people doing things.